The three-mile barrier stretch of Clearwater Beach, Fl is perhaps one of nature’s most inviting aquatic playgrounds. Even those who would typically remain on the sand will be lured into these calm waters. It is unlike any other beach where the water is clear as glass. All ages will be found playing, splashing or sitting in the Tampa Bay waters. 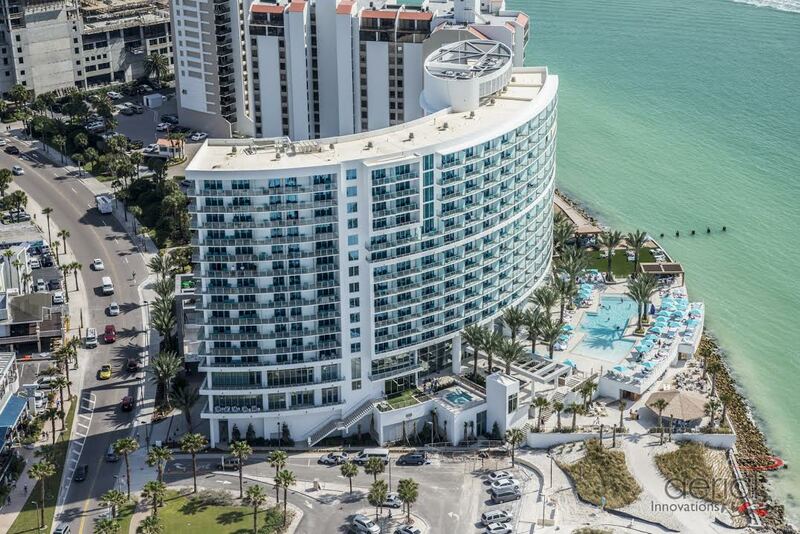 The place stay without a doubt is the recently opened Opal Sands Resort in Clearwater Beach. All appointed guest rooms and suites offer stunning balcony views of the Gulf. A private pool deck faces the ocean where the most brilliant sunsets paint the sky. It is the perfect family getaway where kids have pool time while adults take in the views, of course, with a cool beverage in hand. The dining at Opal Sands is exquisite. To say that you just can’t go wrong sums up the quality at Sea-Guini. The venue uses only the finest local farm to table and ocean to table ingredients. A highly recommended coastal fare is the local pan seared hogfish. The light, buttery fish is served with roasted florida corn broth, sweet gulf shrimp, smokehouse bacon, potato hash and roasted cauliflower. It is an amazing medley of flavor. For a heartier meal, go for the Center Cut NY Strip, which is served with baked truffle, fontina potato soufflé and grilled garden asparagus steak. And of course there is the pasta, hence the name. Pasta is made daily onsite and is reflected in the taste. Gluten free is available. The Rigatoni Bolognese is some of the best I’ve had. It is packed with flavor described as butcher block meat simmered with San Marzano tomatoes, basil, fresh heirloom tomatoes, tossed with house crafted rigatoni and sharp sheep’s cheese. Sea-Guini is open for breakfast and lunch, with a hearty breakfast buffet. The drinks are simply fun. Check out the Berry Mule made with clementine vodka, fresh lime sour, seasonal berries and ginger beer. Additional dining at the resort are the casual, beachside Sand Bar and of course a poolside bar. There is an impressive selection of fresh fare where all ages will find a fav. Another property to consider is Opal Sands sister property, Sandpearl Resort. The distinctions between the two are that Sandpearl has its own beach and is more kid friendly. Sandpearl has plenty of kid activities at Camp Ridley as well as s’mores every night on the beach. Enjoy bayside dining at Caretta on the Gulf. Check out the sushi which is fresh and flavorful. The Surf & Turf Roll is great choice, which includes lobster and beef tenderloin. For some additional play, enjoy Pier 60 at Clearwater Beach which offers nightly entertainment and crafts sold by local artisans. It is within walking, or swimming distance, from either Opal Sands or Sandpearl Resorts. Clearwater Beach is a perfect destination for a family beach getaway. And the ideal choices for stay are Opal Sands and Sandpearl Resorts where hospitality, luxury and family fun await. Big Cat Rescue is an animal sanctuary near Tampa, Florida, rescuing and housing exotic felines and rehabilitating injured or orphaned native wild cats. The Dali Museum in St. Petersburg offers a curated collection of Salvador Dali. Learn how Dali reinvented the art movement of Surrealism and influenced art and film. See the brilliant collaborations between Dali and Walt Disney in rare form.